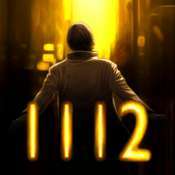 1112 is a HD-remastered game based on FADE that was released in 2001 on Windows Mobile. Both were made by French developers with the same leader. It is broken into chapters for iPod / iPhone / MAC (OS X 10.6.6 or later). Episode 01 (Jan) Louis Everett is leading a quiet life and minding his own business as the most average middle class citizen. He lives with his beautiful but rather nosy wife in the peaceful Jalonsville New Jersey. Take a journey to explore this intriguing mystery and discover the reasons behind his constant headaches and strange dreams. Meet a bunch of colorful characters, dive into bizarre situations until an unpredictable event occurs and turns everything upside down! Episode 02 (Jan) Louis has arrived in New York in a rather mysterious way. Help him discover why he has ended up in New York and follow his adventure promising unexpected developments and encounters. Episode 03 (Aug) Louis is back in Jalonsville by means of an enigmatic passageway. The mystery thickens; our hero begins to stagger into madness. Can you help him regain a foothold in reality?